How 4.5 Inch Circle Magnets Can be Used for Generating Productive Advertising Campaigns? Many online and offline entrepreneurs search low and high for finding effective and productive promotional strategies. They may or might have tested various digital campaigns and traditional campaigns over the years for positioning their advertisements with or without success. However, magnet advertising opens before them a new world of advertising, which they can utilize for the best of benefits. This blog discusses about generating productive advertising campaigns over 4.5 inch circle magnets. 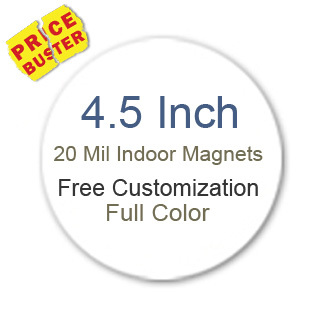 Now you may ponder, why only 4.5 inch circle magnets and not other promotional magnets? In fact, we are not limiting the scope of tips to any one specific size of advertising magnet, but 4. 5-inch circle magnets are one of the popular ones in the niche. Everyone loves surprises. As long you are offering surprises, people would like to share the news with one and all in their network. For example – In 2010, KLM took it to Twitter to find people tweeting about them. They tried to track certain segment of passengers and handed them small, influential promotional gifts. In return, those passengers tweeted about the surprise gifts they received and KLM received one million impressions in Twitter alone. Doesn’t that surprise amazing? Now you may say that magnet advertising is unlike digital advertising and you cannot measure the clicks and impressions. It is true, but still you can incorporate an element of surprise in your message. Productive advertisements are the ones, which can stir emotional reactions and you can attempt it easily over these customized 4.5 inch circle magnets. People love to be inspired and they would definitely share such promotional stories as far as they can. For example – Perry Sports floated a famous advertisement on how a young blind boy started skating at the age of 10 using safety equipment produced by them. However, the overall tone of the advertisement was inspiring people. Stirring emotional reactions can be easily done over circle magnets 4.5 inch because they offer large space for experimentation and free full color printing enables you to go creative with campaigns. Why you? Should be the foremost question, you are trying to answer through your advertisement. Try to create a feeling of uniqueness by generating special advertisements. For example – Red Bull Space Jump advertisement is being hailed as one of the brilliant marketing advertisements in You Tube. This advertisement was remarkable due to its theme ( space travel), space, stunts and colorful creation and surprisingly Red Bull decided to release this advertisement on YouTube, which enabled businesses to embed this video on their website for promoting their product. And it literally happened! In the whole fiasco, Red Bull got free advertisement on others website. Many marketers are seeking circle magnets 4.5 inch for promoting their unique loyalty programs; you can do the same because people would be interested to know about them. You can recreate this feeling of uniqueness over circle magnets 4.5 inches. Save on online design proof, art setup, shipping, and full color printing because they are offered FREE for personalized magnets on online stores stocking made in USA magnets.